The Slow Goodbye of Apple's Former Cash Cow. This chart shows Apple's iPod sales in units and as a percentage of the company's total revenue since 2002. Apple killed off the iPod Shuffle and iPod Nano recently, effectively trimming down its line of portable music players to just one model: the iPod Touch. According to Business Insider, the company confirmed the discontinuation of both devices in an email after they had disappeared from the Apple Store website. The announcement doesn't come as a surprise considering that both iPods haven't been updated in years and do not support streaming services such as Apple Music and Spotify. The decision to further reduce the iPod lineup marks another chapter in the popular music player's slow but steady decline. When the first iPod was released in the fall of 2001, it rang in the age of digital music and quickly became Apple's cash cow. As our chart illustrates, the iPod accounted for as much as 40 percent of the company's revenue in 2006, just before the iPhone was released. With the growing popularity of smartphones however, MP3 players were gradually pushed towards obsolescence and iPod sales started declining in 2009. 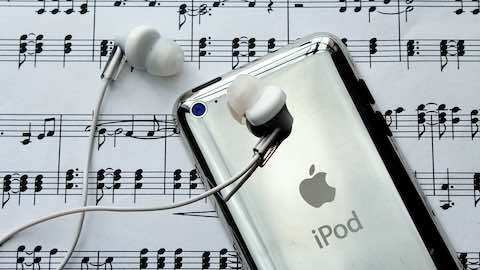 In 2014, the last year Apple broke down iPod sales as a separate category, the company sold 14.4 million iPods, down from nearly 55 million units in 2008. That year (2014), the iPod accounted for just 1.25 percent of Apple's revenue, explaining why the company had no problem pulling the plug on two more models this week (the iPod Classic was discontinued in 2014). It'll be interesting to observe how long Apple will keep the iPod Touch around, which is effectively a less expensive, less powerful iPhone without the cellular connection. Personal Tech & Gadgets "Goodbye iPod"